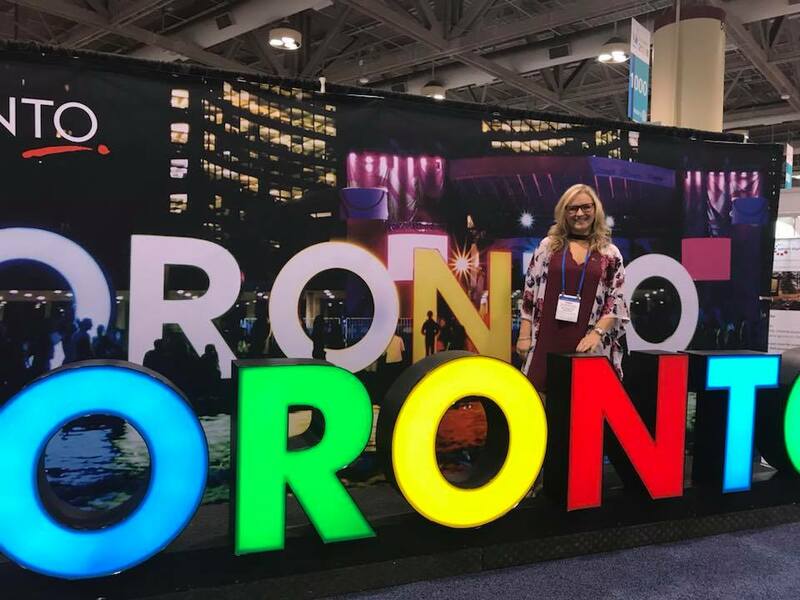 Incoming President, Trisha Kennedy, spent the last week with over 25,000 Rotarians from across the globe. 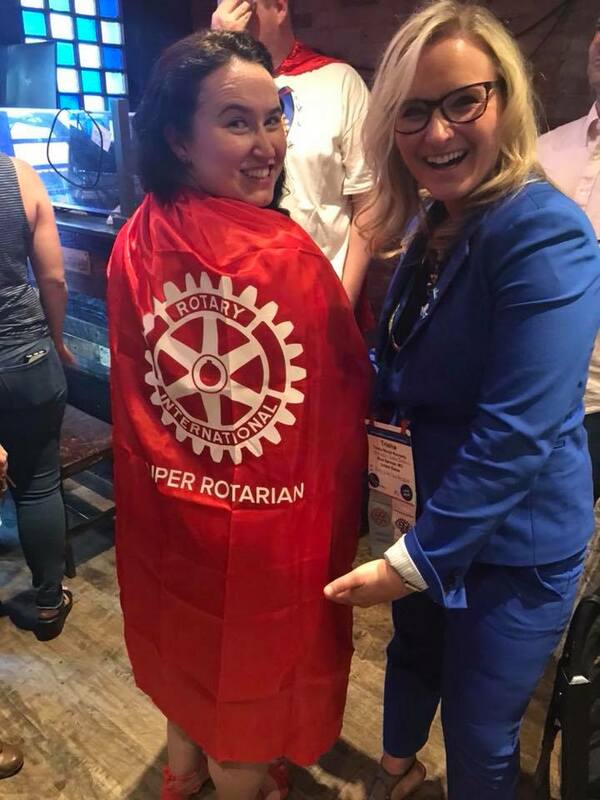 She was able to meet and make friends with other Rotarians across the globe that are making an impact on their communities. 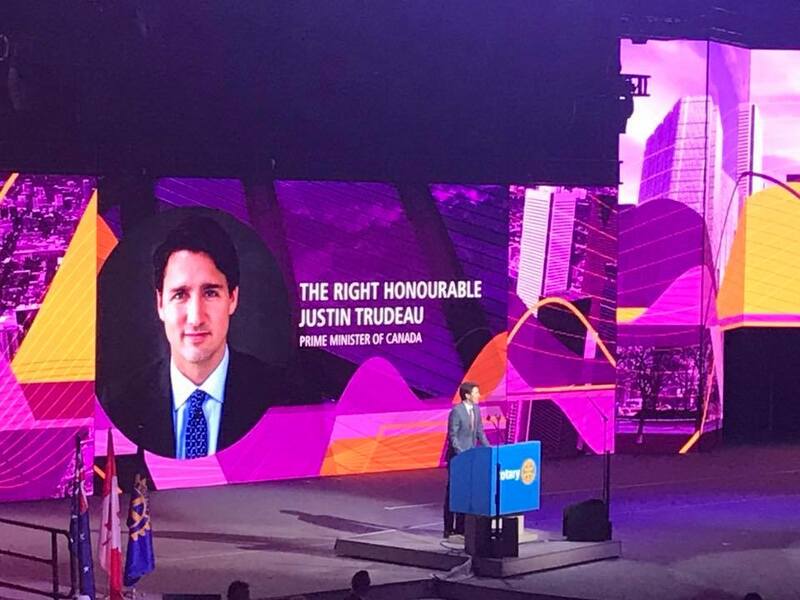 She was also able to hear some amazing speakers such as: Laura Bush, Prime Minister of Canada Justin Trudeau, A Rwanda survivor who is a graduate of the Peace Fellow Academy, and so many more. 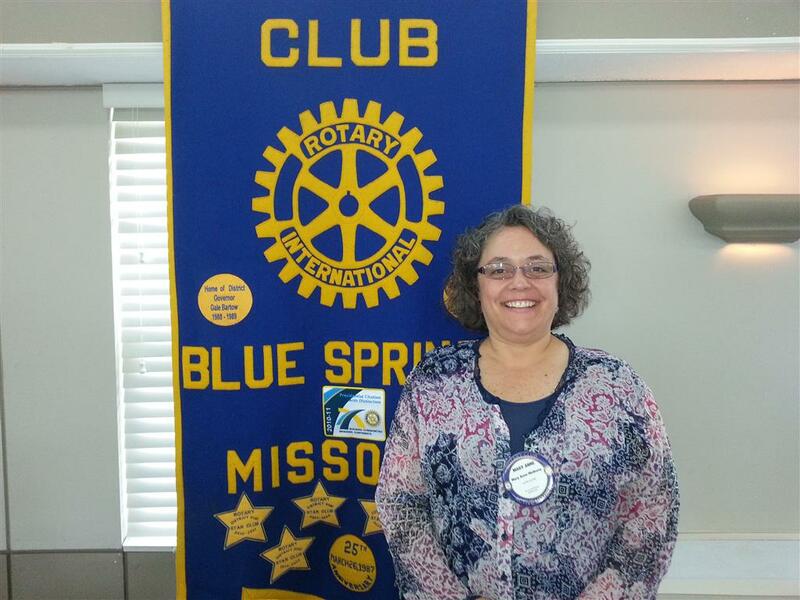 She will be bringing back a wealth of knowledge to help the Rotary Club of Blue Springs grow larger and give bigger. 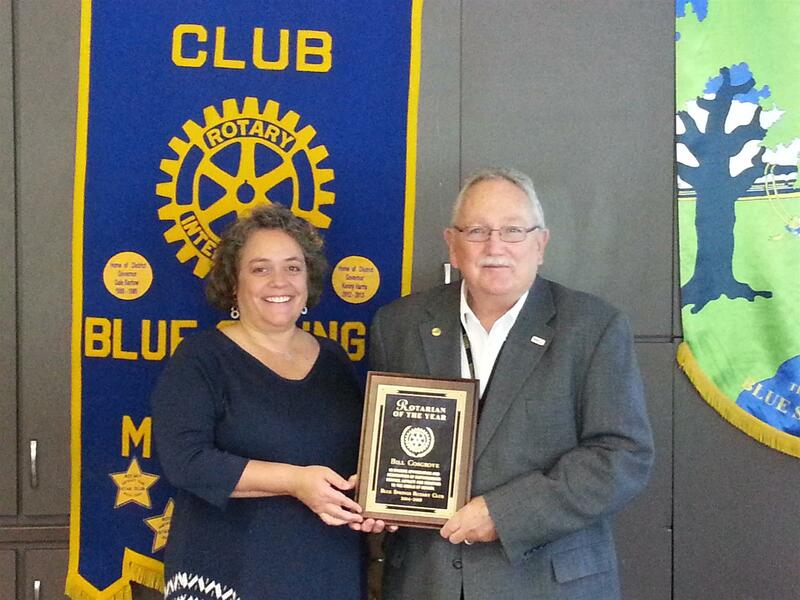 Bill Cosgrove named as 2014-15 Bob Clayton Rotarian of the Year for the Blue Springs Rotary Club. 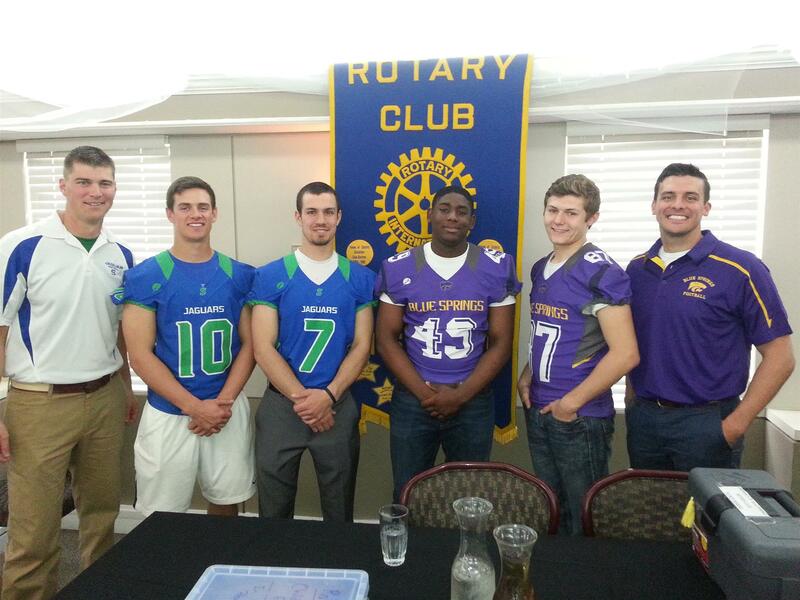 The Blue Springs Rotary has "Changing of the Guard" ceremony.. 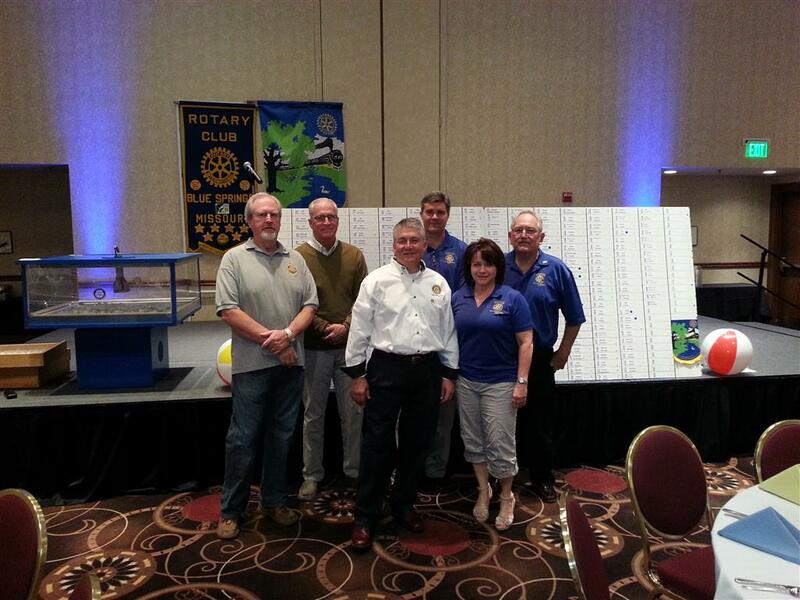 The 2015 Blue Springs Rotary Car Raffle another huge success. 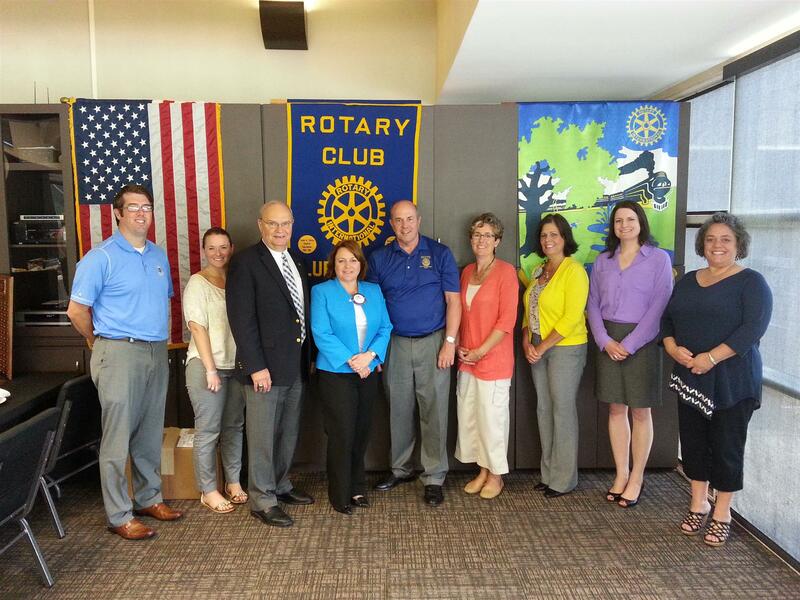 The Blue Springs Rotary Club has a new home. 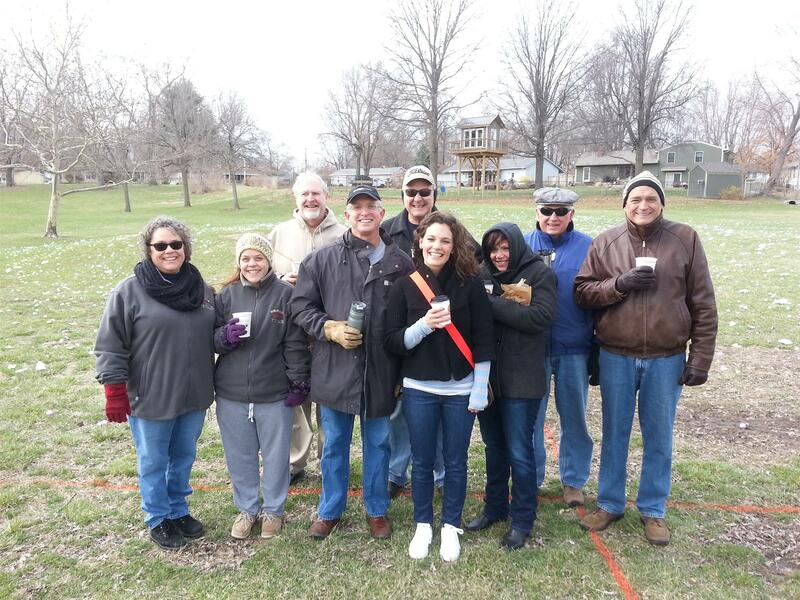 Blue Springs Rotarians help the 2015 Easter Bunny at Rotary Park. Football players from the Blue Springs and Blue Springs South High Schools join to build houses in Jamaica. 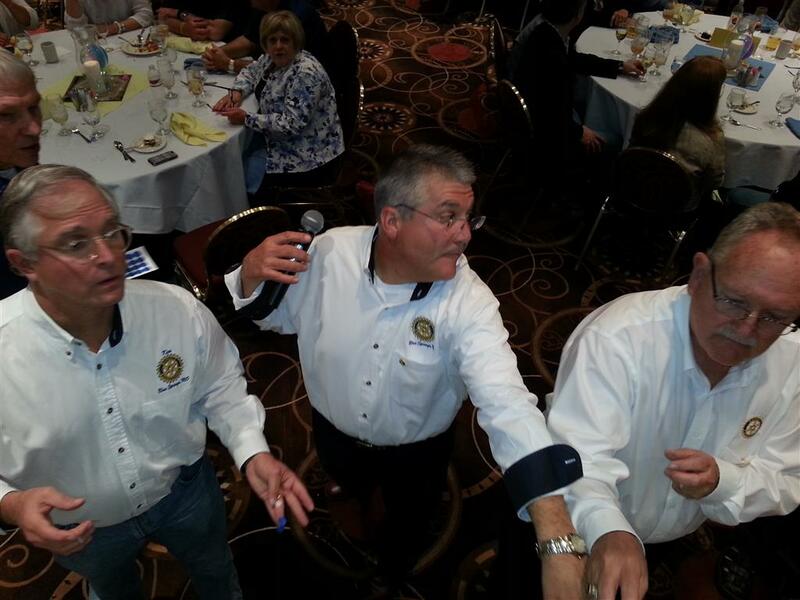 The Blue Springs Rotary Club held their annual "Changing of the Guard" banquet on Wednesday, June 25, 2014 at the Country Club of Blue Springs, MO. 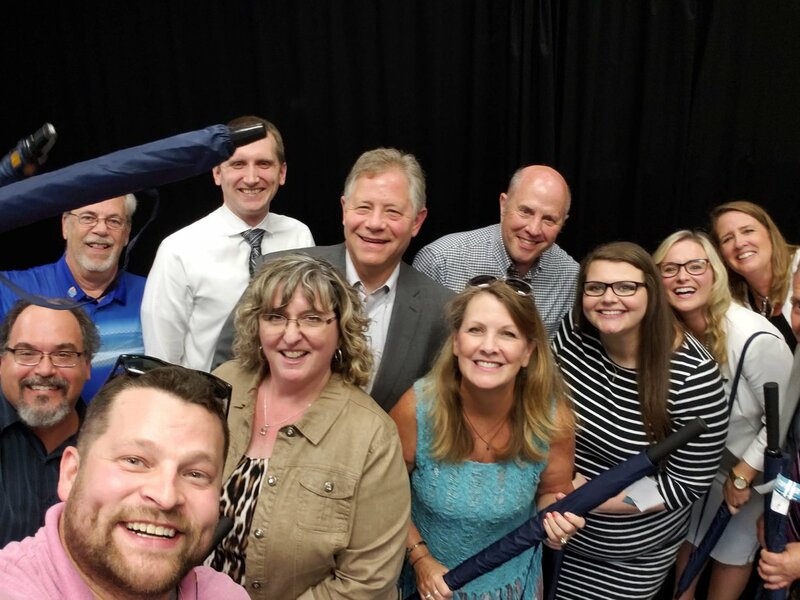 This annual banquet celebrates the accomplishments of the 2013-14 Rotary year under outgoing President Jim Finley, and to install the new president, board of directors, and to name the Rotarian of the Year recipient. Paul Harris Fellow recognition will be a future program. 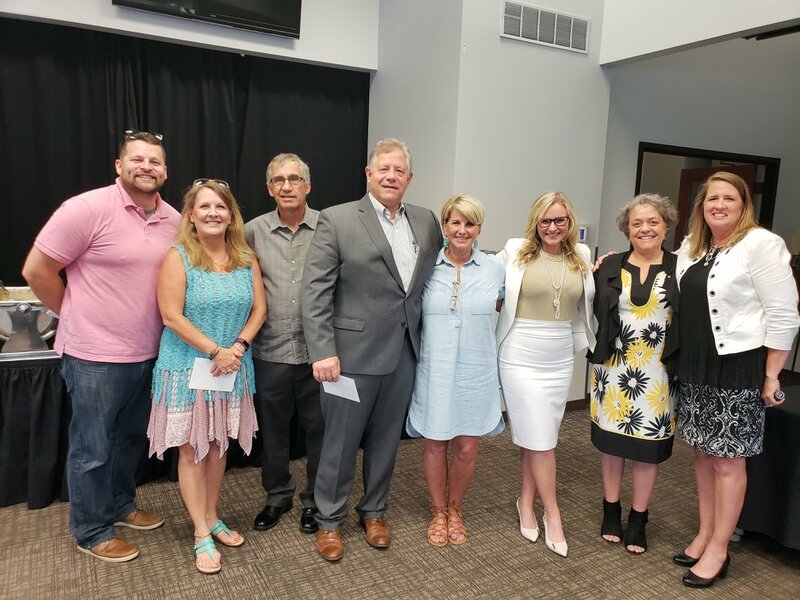 Prior to the new officer installation, President Jim presented contributions to the chosen charities that the Blue Springs Rotary Club has chosen to support this year. During the evening, over $9,500 was given back to the community through these charities. Past District Governor Kenny Harris had the honor of installing Mary Anne and her Board of Directors for the 2014-15 Rotary year. Outgoing club President Jim Finley then presented the honored "Rotary Gavel" to incoming President Mary Anne. In her acceptance talk, she spoke of the 2014-15 Rotary Theme "Light Up Rotary" and how it fits with her vocation as Executive Director of Hope House. A large number of Rotarians and guests were present to thank outgoing President Jim for an outstanding year of accomplishments, and to wish Mary Anne, and her board, the best of luck and to pledge their support for the incoming Rotary year. Mary Anne's family, husband Graham and daughter Chloe, were present to watch her take the gavel and embark on another great year of service. Rotarian Shawn Roderick is presented the Bob Clayton Rotarian of the Year award for 2014. Blue Springs Rotary Club President Mary Anne Metheny presented the coveted Bob Clayton Rotarian of the Year award to Rotarian Shawn Roderick. Shawn served as Youth Services Director for 2013-14 and was instrumental in the formation of the Interact Club at Blue Springs High School and chaired the Blue Springs Rotary Scholarship committee to oversee and choose the recipients of the (5) highly competitive Rotary Scholarships awarded each year to area seniors. 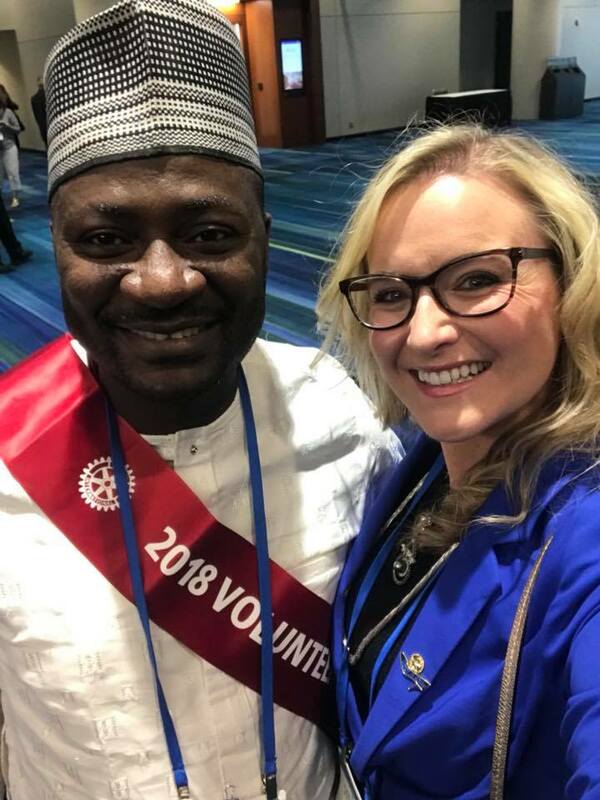 Shawn has joined a long list of deserving Rotarians who have served above and beyond what their duty asked them to do, and will be rewarded with a Paul Harris Fellowship.. 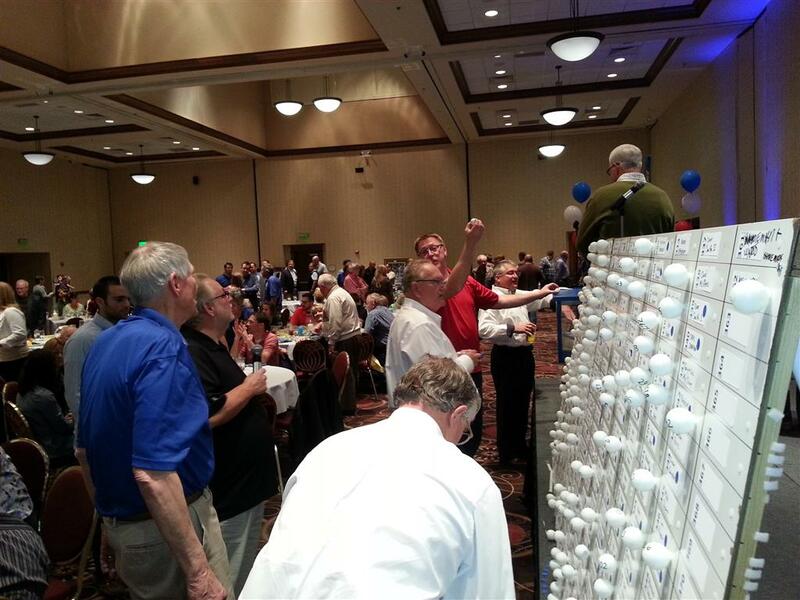 The Blue Springs Rotary Car Raffle a BIG success....again! Rotarian Mike Hilker and Blue Springs Ford present a $5,000 check to kick off the 23rd Annual Blue Springs Rotary Car Raffle. 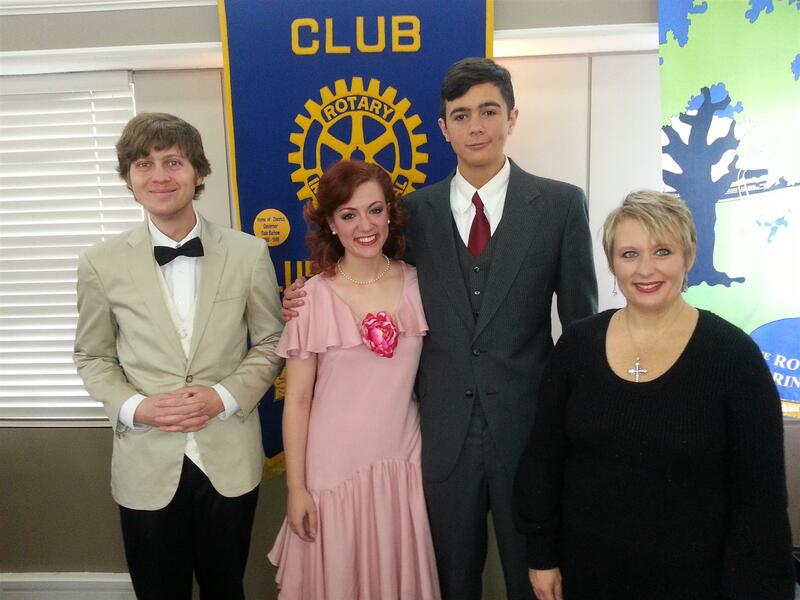 Melodie Chrisman is inducted into the Blue Springs Rotary Club..
Mary Anne Metheny attends Show Me Rotary. 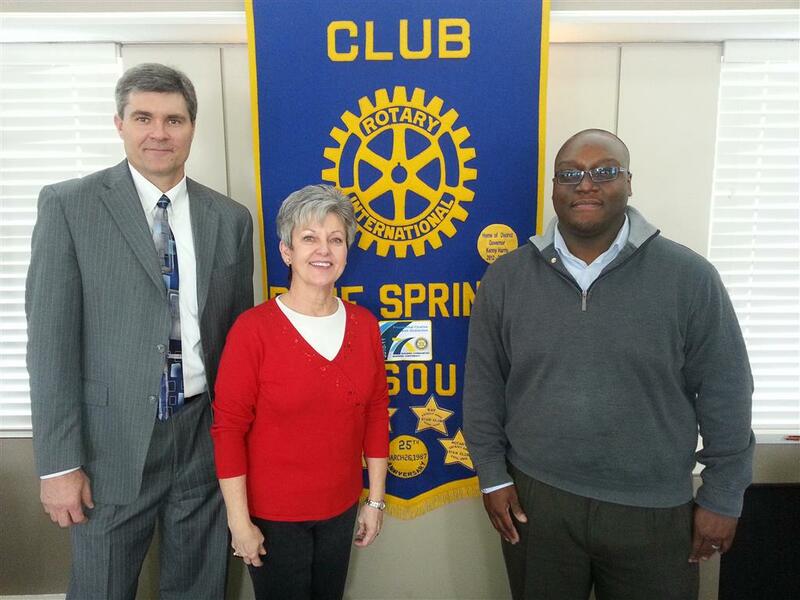 The Blue Springs Rotary Club welcomes Lamar Crump as our newest member. 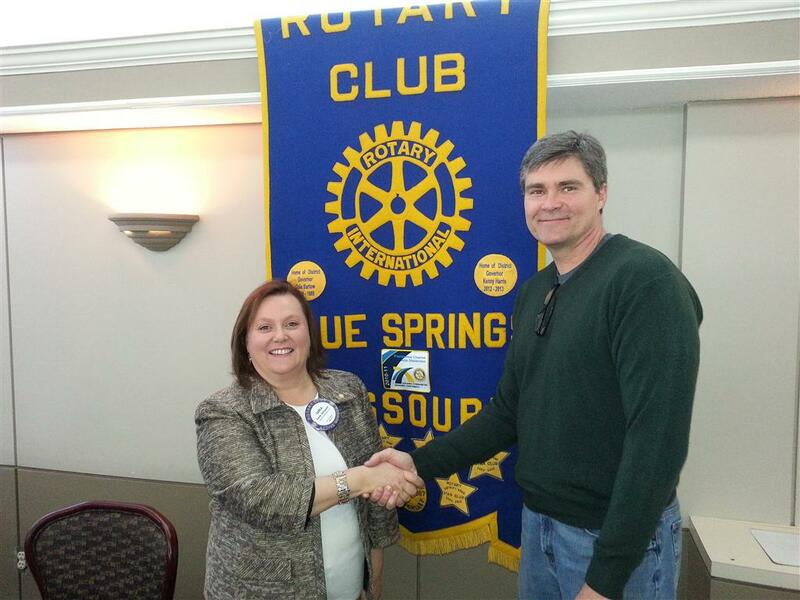 President Jim Finley welcomes Lamar Crump into membership to the Blue Springs Rotary Club. Lamar is the manager of the new Walmart Neighborhood Market in Blue Springs, MO. Lamar is a lifelong Kansas City area man and is happily married with two children. Lamar is very active in his church and we look forward to his eager and energetic approach to service in our community. He has a heart for community service and will be a great asset to Rotary. 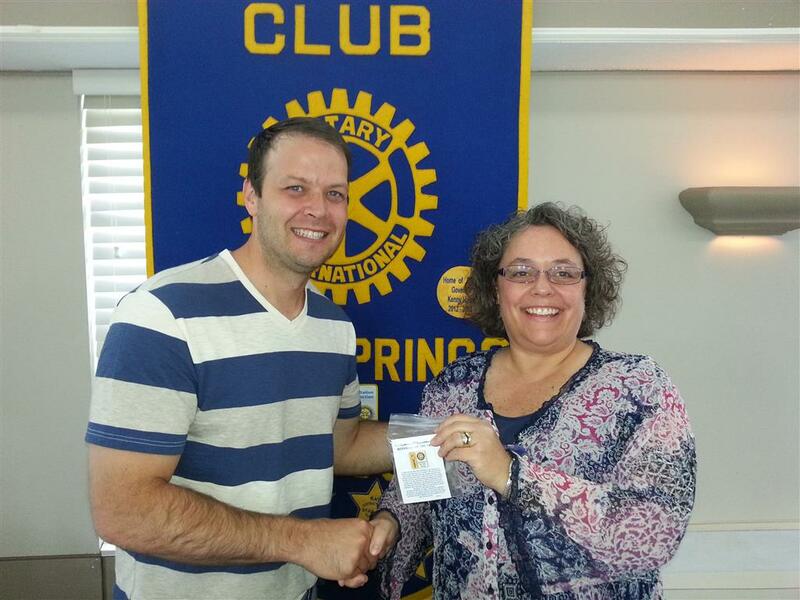 Lamar was invited to join the Blue Springs Rotary Club by longtime Rotarian Carolyn Pittsenbarger. Yes, our club is getting younger (and better) with young men like Lamar willing to share themselves with us. We welcome Lamar and his family to Rotary. 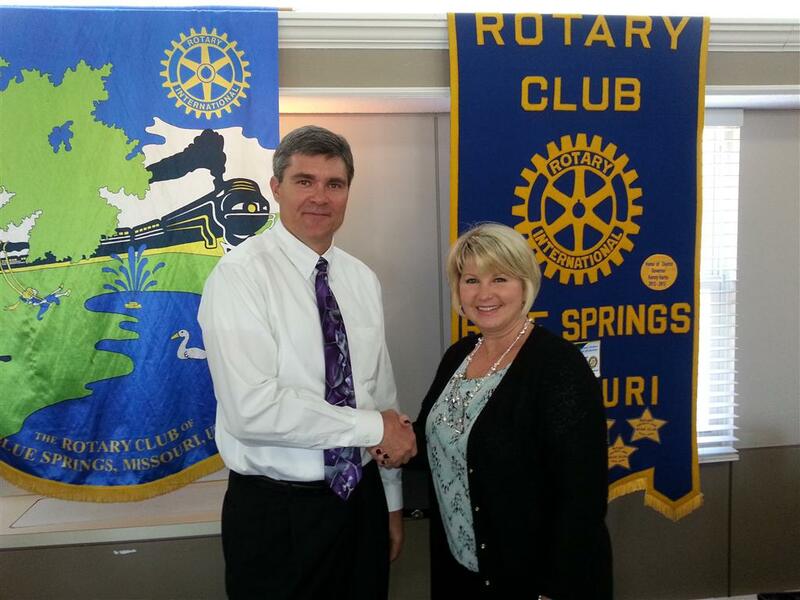 President Jim Finley welcomes Carla Simpson into the Blue Springs Rotary Club. 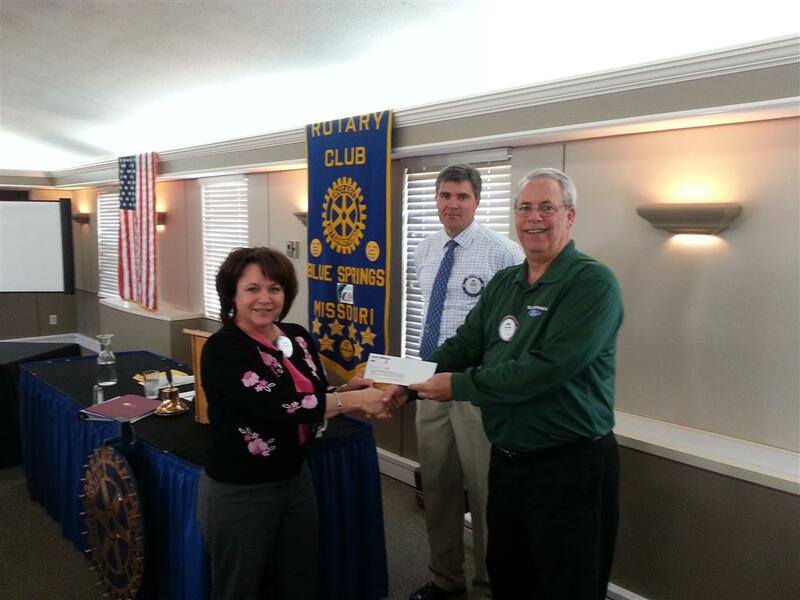 The Blue Springs Rotary Club welcomed Carla Simpson as their newest member on Wednesday February 5, 2014. Carla's sponsor is longtime Rotarian Emagrace Colley, who invited Carla to join our club. 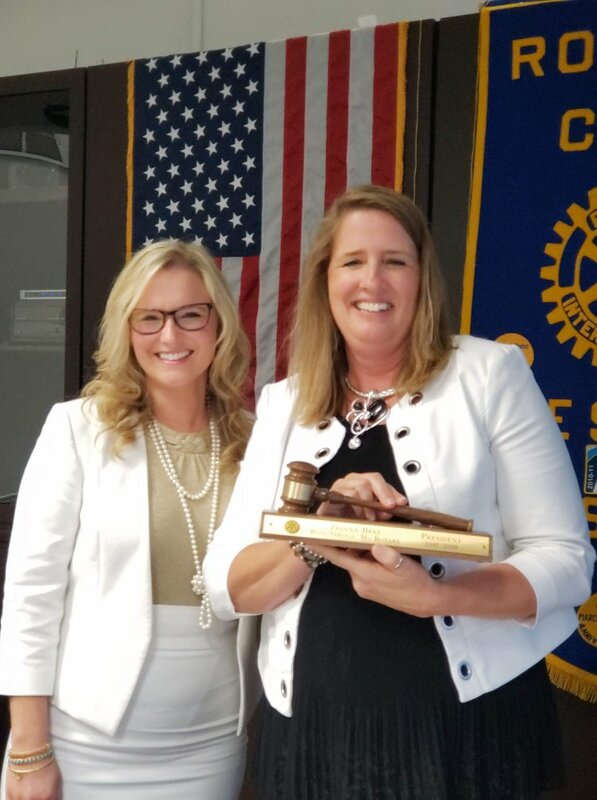 The induction ceremony was performed by Past District Governor Kenny Harris in front of a small group of Rotarians who braved the snow and cold to welcome Carla into our club. 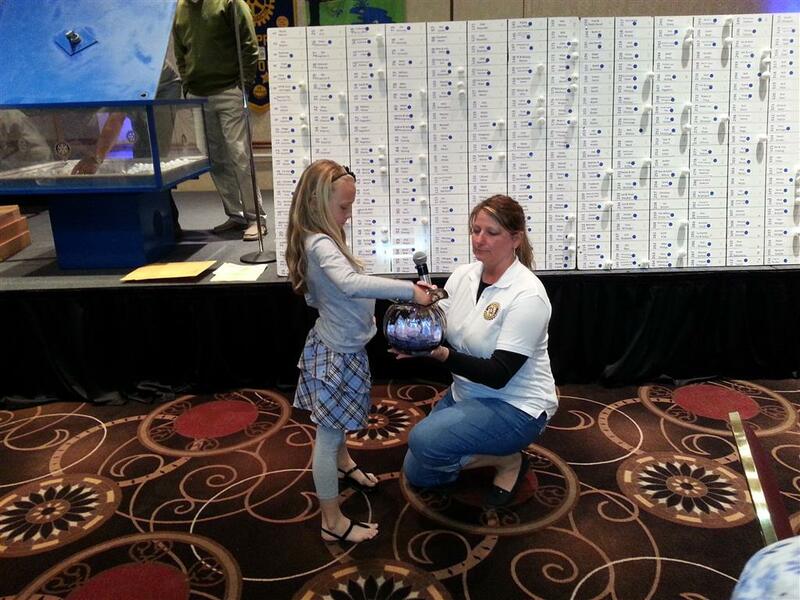 Carla joins 80 other club members who are dedicated to serving to others. 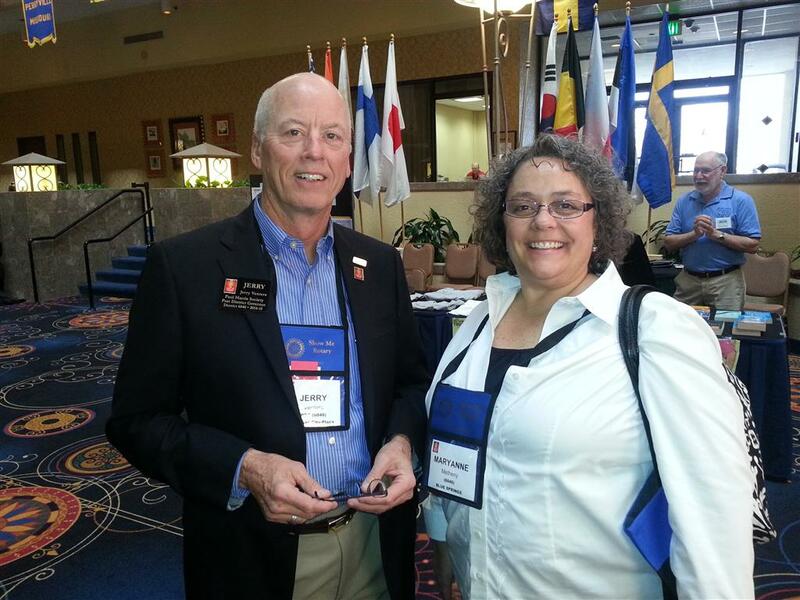 Carla will be an excellent Rotarian and we welcome her with open arms. 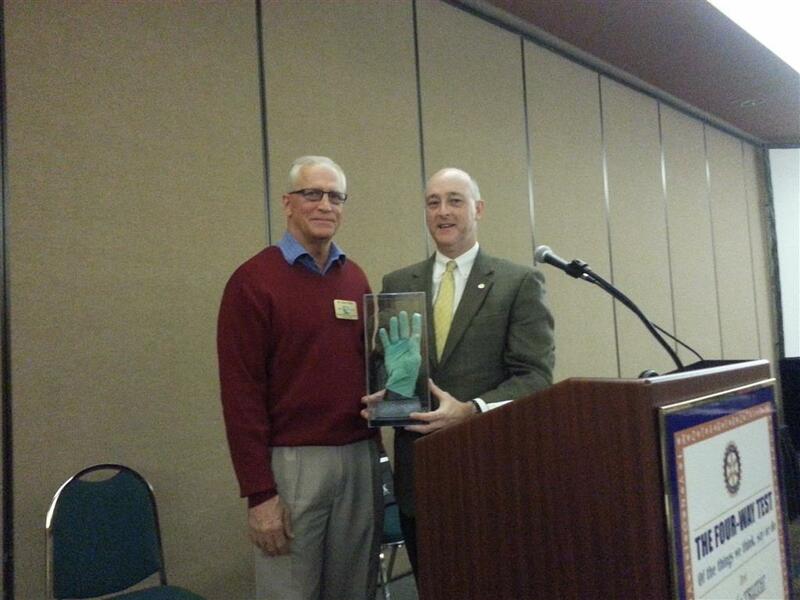 Rotarian Ron Wilds presents the "Green Glove" to RI Director Larry Lunsford. 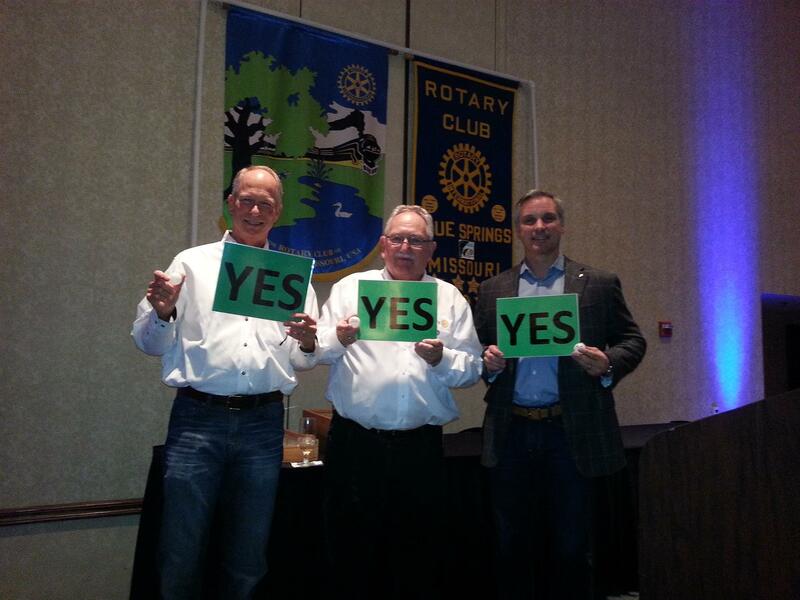 Blue Springs Rotarian Dr. Ron Wilds surprised current Rotary International Director Larry Lunsford with a hand sculpture fitted with a green surgical glove at Rotary District's annual Conference held at the Airport Embassy Suites on Saturday November 9, 2013. This glove is the exact glove Director Larry had worn many years ago to place a pair of shoes on the feet of a Russian orphan named Victor, and this memory held a very significant place in Larry's heart. The presentation took place at the final session of our District Conference and Director Lunsford was very moved by the presentation as he told the story of the glove. Attending the District Conference and Rotary Foundation Dinner, were Immediate Past District Governor Kenny Harris and wife Donna, Assistant Governors Bob Hagedorn and Ron Wilds, Past President Bill Cosgrove and Rotarian Debbie, current club President Jim Finley, President Elect MaryAnne Methany, Rotarians Jay Dorst and Penny Donnelly. The hand sculpture was completed by E. Spencer Schubert, whose subjects include longtime Kansas State football coach Bill Snyder. The Blue Springs Rotary Club achieves RI President Sakuji Tanaka's "Presidential Citation" Award. The Blue Springs Rotary Club, under the leadership of 2012-13 Club President Bill Cosgrove, was awarded the 2012-13 "Presidential Citation" award, which 2012-13 RI President Sakuji Tanaka (Japan) encouraged each of the 34,000 Rotary clubs in the world to strive to achieve. 2012-13 District Governor Kenny Harris presented the award to Bill at the annual District Conference for Rotary District 6040. Of the 56 Rotary clubs in District 6040, only 20 clubs achieved this award. This award is achieved by Rotary clubs who complete requirements set by the Rotary International President. 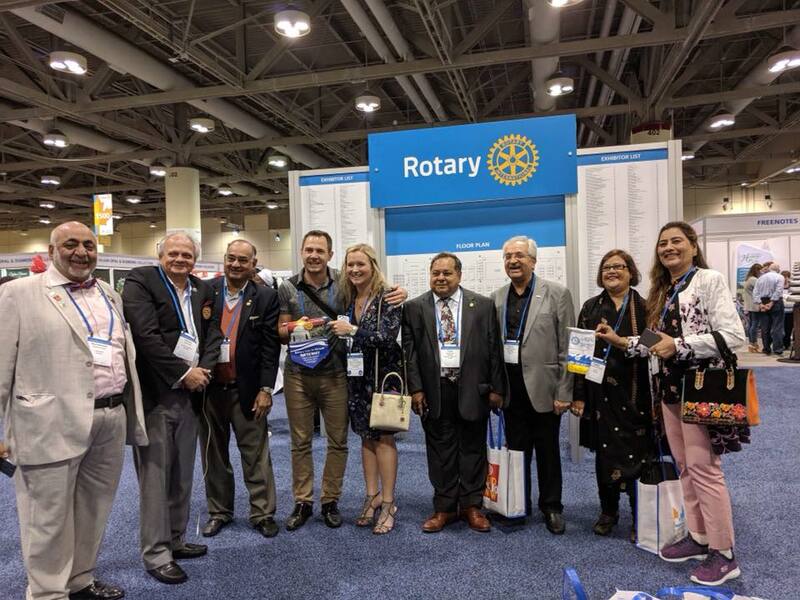 These requirements include meeting and exceeding components in each of Rotary International's 5 Avenues of Service, along with programs and projects promoting world peace through education and services. Only strong, healthy clubs achieve these stiff requirements. 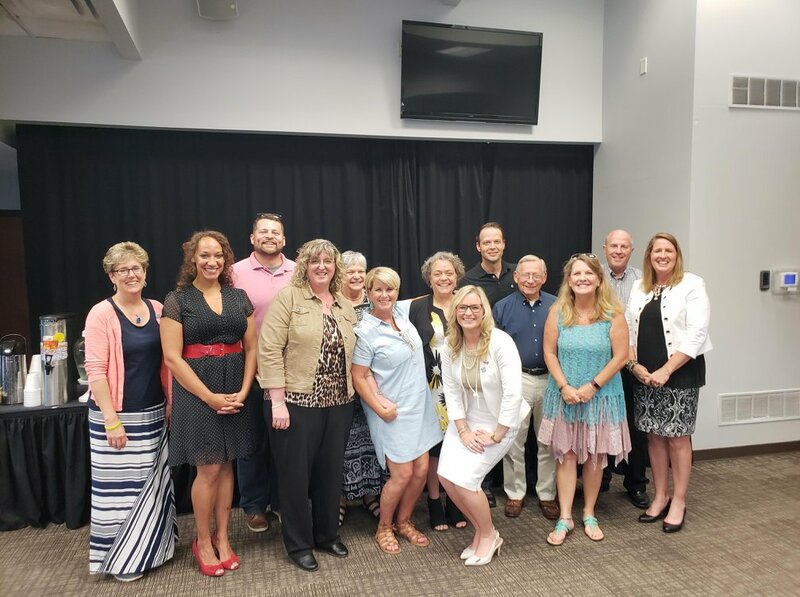 Congratulations to all the members of the Blue Springs Rotary Club, and especially to President Bill Cosgrove for his leadership, guidance and patience. Community Unity Week is the second week in October. The week ends with the Blue Springs vs Blue Springs South Football game. On October 9, the high school students who traveled to Jamaica this summer for their mission trip will present to the community about their experience. This will be held at Noon at the Blue Springs High School Performing Arts Center. Lunch will be served by WingStop and Chick-fil-A and this will be the location of our Rotary meeting for the week. Space is limited so please RSVP by responding to this email or signing up at our meeting Wednesday. Attached you will find a list of club members who have signed up to attend. This will also include a food drive to benefit Community Services League. 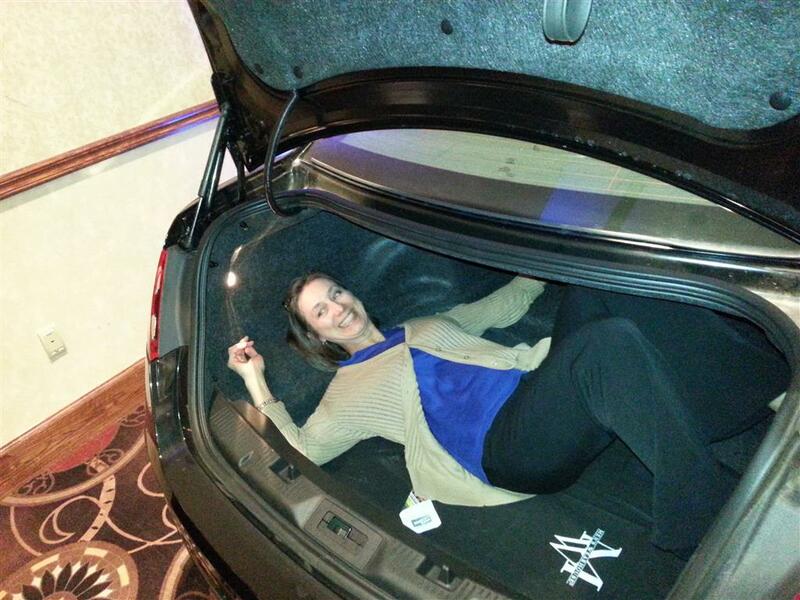 If there is a Rotary volunteer project she is there. If the project includes Rotary family, she makes sure they are there to learn and help. 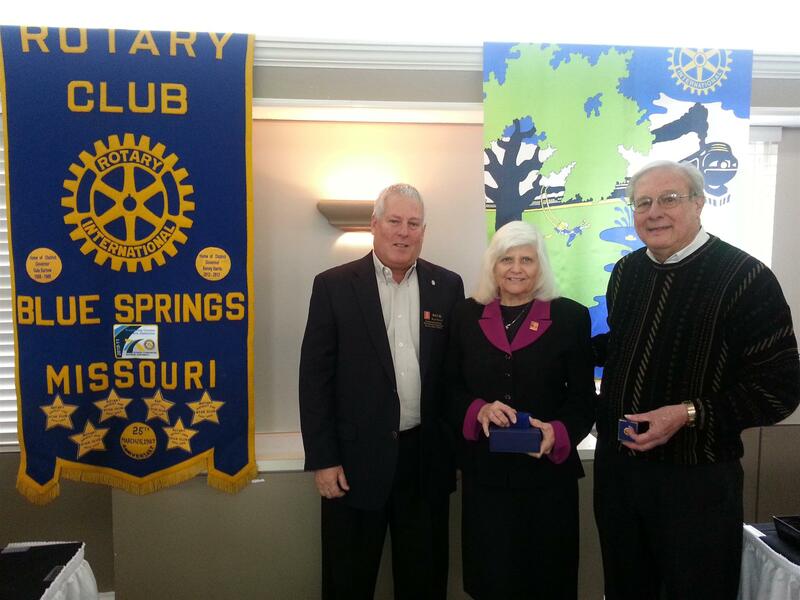 Volunteering is part of her life and she is one of the best contributors to Blue Springs Rotary. Mary Anne has served on the Board, is the current Community Service Chair, and will be President Elect in 2013-2014. Mary Anne joined the club in 1998 and lives and breathes “Service Above Self” each day in both Rotary and her life in community service. As CEO at Hope House a shelter for women and children victims of domestic violence, Mary Anne has seen the worst and best in people. She is a constant organizer behind the scenes and is a leader, “she can get it done. ’’If there is a Rotary volunteer project she is there. If the project includes Rotary family, she makes sure they are there to learn and help. Volunteering is part of her life and she is one of the best contributors to Blue Springs Rotary. Mary Anne has served on the Board, is the current Community Service Chair, and will be President Elect in 2013-2014. 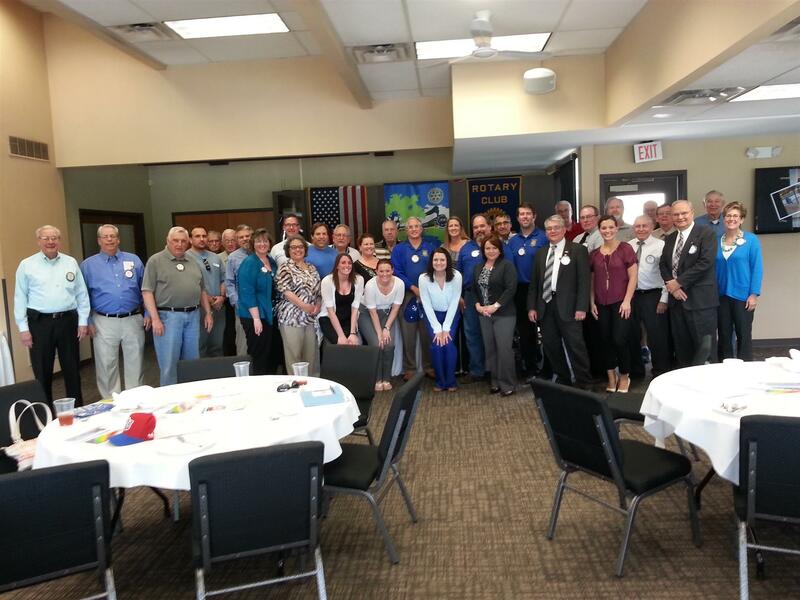 Welcome to the Blue Springs Rotary Club. 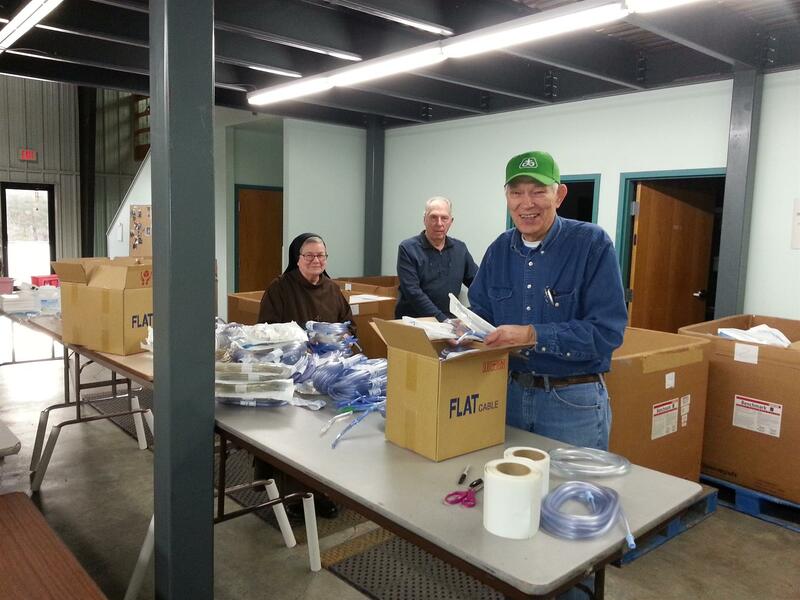 The Blue Springs Rotary Club is an International Service Organization comprised of local community leaders, business men and women from all vocations. Our core values are Service, Fellowship, Diversity, Integrity and Leadership. We recognize and value the worthiness of all useful occupations. The Club has approximately 80 friendly, active members who meet at 12:00 Noon each Wednesday at the Adams Dairy Golf Course Clubhouse, 1601 NE R.D Mize Rd in Blue Springs, Missouri, 64014. 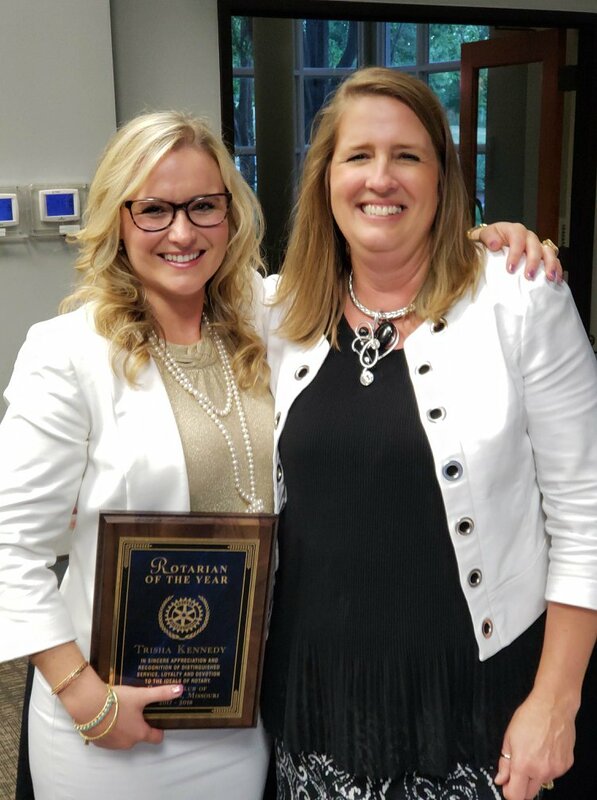 The Blue Springs Rotary Club has consistently received the Rotary "Presidential Citation" Award, which is awarded to clubs who meet and exceed the requirements set by the sitting Rotary International President. These requirements involve active participation in Rotary's 5 Avenues of Service: Vocational Service, Club Service, Community Service, International Service and New Generations Service. 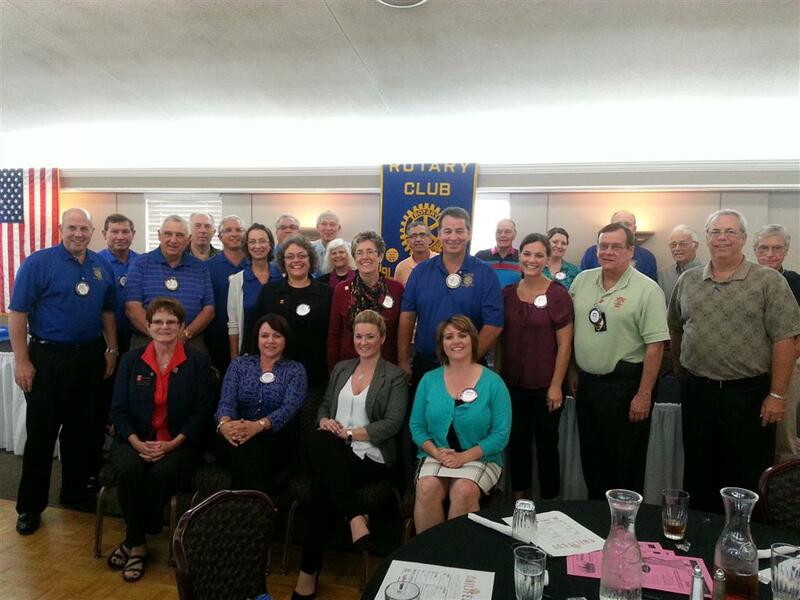 The Blue Springs Rotary Club is 1 of 56 Rotary Clubs in Rotary District 6040, which covers all of northern Missouri. Worldwide, there are over 34,000 clubs in 532 Districts in 200 countries with approximately 1.2 million members. All of these clubs are devoted to helping the less fortunate, feeding the hungry, healing the sick and infirm. Membership is by invitation to any citizen who loves to laugh, have fun and socialize all in the spirit of service to others. Visitors are always welcome. Email Membership Chairman Christina Brown (thebrownteamwecan@gmail.com) for more information.